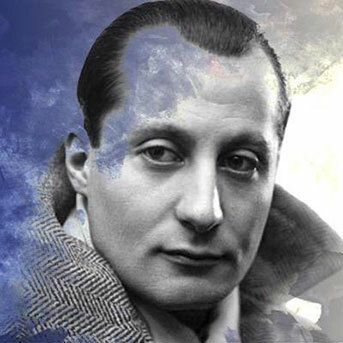 José Antonio Primo de Rivera y Sáenz de Heredia was born in Madrid on April 24th 1903 though his family roots connected him with the lands of Jerez de la Frontera in the province of Cadiz. He was the eldest son of five children who were orphaned in 1904 when they lost their mother. Even though his family comes from a military background, he chose instead to study law which he pursued in the Central University of Madrid where he obtained his Bachelor’s degree in law in 1922. As the son of the dictator who ruled in Spain between 1923 and 1930, he never took part in politics until the death of his father in his Parisian exile scarcely a few weeks after resigning from his charge as a ruler. From him he inherited the title of Marquis de Estella. With the sole purpose of restoring his father’s memory which had been strongly criticised by the supporters of the old politics, he participated in the project of the National Royalist Union, a very short-lived political organization. He ran for office in Madrid during the Parliamentary elections but failed. He then restricted his public defense of the dictatorship to his speeches as a barrister in court. In 1932 he was arrested under suspicion of collaboration with General Sanjurjo’s coup but he was later released without charge. His rejection of the old political ideas led him to take part in the fascist movement in 1933 by writing an article praising a new design of the social state in the only issue of the newspaper “El Fascio”. Shortly after, he created the Spanish Trade Union Movement (MES) in collaboration with the famous aviator Julio Ruiz de Alda. This organization would in its early times come into contact with the Spanish Front (FE), created by the followers of José Ortega y Gasset. Jose Antonio’s political project gained momentum during the coming months until it was finally introduced at the Comedy Theatre in Madrid on October 29th 1933. A few days later, the new movement was registered under the name of Spanish Phalanx (FE). 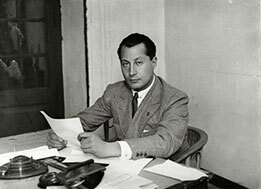 A new period of intense political activity was thus beginning during which he would balance the strengthening demands of the new movement with his duties as a member of parliament after winning his conservatory candidacy for the Cadiz constituency in the 1933 elections. On February 1934 FE (Spanish Phalanx) merged with the Juntas de Ofensiva Nacional-Sindicalista (JONS) ruled by a group of three composed of José Antonio Primo de Rivera and Ramiro Ledesma Ramos under the presidency of Julio Ruiz de Alda. However, his family lineage, the parliamentary platform and his valuable personality made him the supreme representative of the FE de las JONS right from its beginning. This led to his proclamation as the national party leader in October 1934. As the Phalangist ranks grew, they would rid themselves of eminent monarchists who had become a burden in Jose Antonio’s political project. But the turning point in the path of Jose Antonio’s political thoughts was marked by the defection of Ramiro Ledesma, becoming increasingly distant from the fascist corporate spirit. From his parliamentary seat he pointed out the true causes of the revolution of October 1934, he described the problem of Catalan sentimentality, he opposed the conservatives rural counter reform and harshly criticised the corruption of the radical politicians. In spite of the National Front proposal against the Marxist menace in Spain, it was ignored by all right-wing parties and so the Phalangist candidates ran for office independently in the elections held in February 1936. They did not obtain any seats. On March 14th 1936, Jose Antonio was arrested along with the members of the political board of the FE de las JONS and charged with illegal association but was later acquitted by the court. He was however held in prison upon instructions from the government of the Popular Front and he was never to be released. 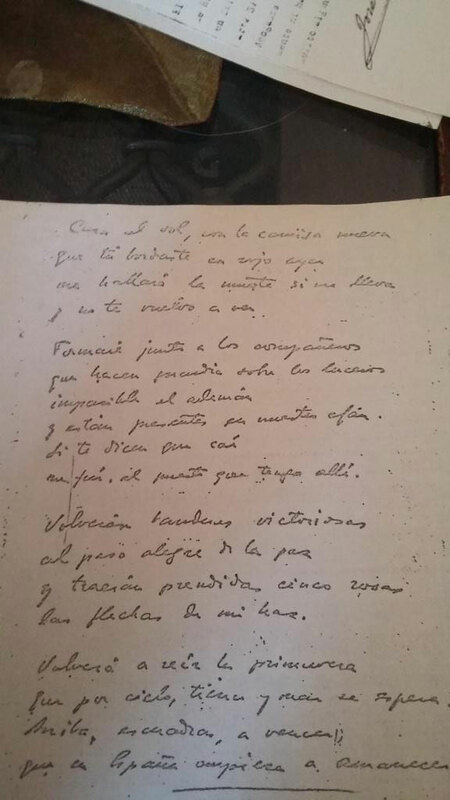 While his comrades were being persecuted (jailed or assassinated), Jose Antonio faced several trials until he was transferred to Alicante prison on June 5th 1936 where he would still be when the uprising took place on July 18th . Eager to end the tragedy of war, he offered to mediate with the rebels in order to establish a regime of national salvation but his offer was ignored by the Republican government. He was tried for rebellion and sentenced to death. He was executed by a firing squad at dawn on November 20th 1936. 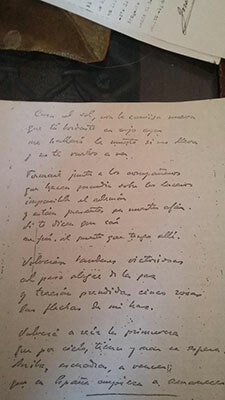 Barely a few hours prior to his death, he had written his will and testament: “I wish that my blood be the last of the Spanish blood spilled due to civil discords”. Once the war was over, his remains were transferred to the San Lorenzo del Escorial monastery. There they lay until March 30th 1959 when he was buried in the main altar of the basilica de la Santa Cruz del Valle de los Caídos. He was carried on his comrades’ shoulders many of whom did not get the chance to know him while he was alive. On his granite gravestone there is a simple engraving with the name with which he has passed into history: JOSÉ ANTONIO.